Shale, a fine-grained sedimentary rock formed from silt or clay particles, holds chemical clues to one of Earth’s most dramatic geological events – when continents first bobbed well above sea level. Using the Pomona College X-ray Fluorescence Laboratory (XRF), Associate Professor of Geology Jade Star Lackey with Trevor Pontifex ’18 and Christopher “Cal” Neikirk ’19 analyzed the chemical elements of shale rock from around the world – providing an important check on the results gathered by University of Oregon Professor Ilya Bindeman’s research, published in the May issue of Nature. “We’re answering a deep time question about Earth’s behavior with this work,” says Lackey. Lackey provides an analogy: Imagine dumplings in a pot of stew. They begin as dough that doesn’t have much strength, but nonetheless float near the surface of the pot. As they cook and stiffen, they gain strength and begin to rise up above the surface of the pot. If the stew cools and thickens, in the same way the mantle would have, those dumplings could sit even higher. Tectonics would move the dumplings around, and when several collide—think of this as assembling a supercontinent—they can rise even higher. Lackey joined Bindeman’s research team in summer 2016, when he and laboratory interns took a look at the bulk chemistry of the shales that were sent to their laboratory. 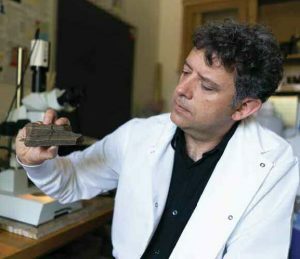 “The important piece of the story is ‘between 2.2 and 2.5 billion years ago, but to see it, we had to go back and scrape ‘together as many shales as we could find, even the rare stuff, going back to 3.5 billion years ago,” says Lackey, who explains that the shales were hard to find and had to be handled with care in the lab. The Pomona College Geology Department counts on a number of specialized lab instruments for faculty and student research. The XRF Lab was founded in 2010 and uses an Axios wavelength-dispersive spectrometer which allows analysis of a wide range of elements that make up the bulk of crustal rocks. “We operate with ‘the highest level of research thanks to the ‘College’s support for major equipment,” says Lackey.